Scorpions grow by shedding their old skin (ecdysis) to allow for a new larger skin. Each ecdysial event creates a new instar which can be seen in this morphometric analysis. 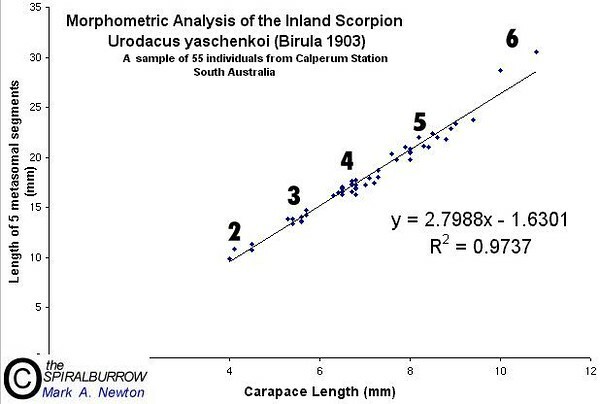 In the study 55 scorpions were randomly trapped from a population in the SA mallee and measured. Measurements included carapace length, fourth tail segment length, entire metasomal length and hand length. 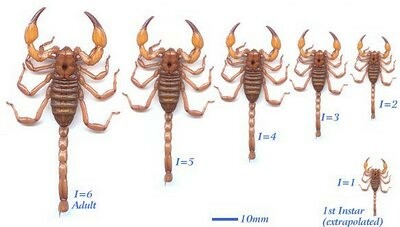 Each group of data points represents an ecdysial or molt phase (instar) in the scorpion's life history. By measuring the samples it can be seen how many instars exist in the population from the 2nd to the adult stage, the first instar is not included as it doesn't leave the burrow until it molts and hence is not measured. For an in depth discussion see Shorthouse and Marples (1980). An interesting component of the graph are the adult data points, they fall above the regression line suggesting the tail length increases at the adult stage. Further studies showed that adult males have a longer tail than females and both the sampled adults were male, no adult females were collected in the random sample of 55, possibly due to the reproductive phase which was also reinforced by the low numbers of 2nd instars. After parturition the numbers of 2nd instars in the population is greatly increased.